Sheryl Sandberg knows a thing or two about resilience. Just over 2 years ago, Sandberg’s husband David Goldberg died suddenly at the age of 47. She never imagined that she wouldn’t grow old with her husband. However, she carried on. Sandberg, chief operations officer of Facebook and bestselling author of “Lean In: Women, Work, and the Will to Lead” and “Option B: Facing Adversity, Building Resilience, and Finding Joy,” shared her story of “post-traumatic growth” with military spouses at Fort Hood, Texas, on Military Spouse Appreciation Day last week. I knew Sandberg “got it” when she talked about how marriage is a partnership and when one career is affected, both careers are affected. That rang true for me as a teacher who left the profession when we had our first PCS. I’ve been cobbling together my side hustles into some semblance of a career ever since, and for a year of that I’ve been raising a toddler on my own while my husband is in Afghanistan. So yeah, as military spouses, we face unique challenges. The nature of our lives requires grit and a healthy sense of humor. Fortunately, there’s quite a lot we can do to overcome the adversities we face. Sandberg gives us the tools and here’s what she said. As military spouses, resilience is part of our daily lives. We’re often separated from our partners and left with significant responsibilities on the homefront. Fortunately, we’re not born with a fixed amount of resilience. We build it and, according to Sandberg, we do that in our military community. Meaning is often derived from times of stress, trauma and hardship. I can’t be the only one who thinks that the time we spend separated from our partners makes us appreciate them more. It helps to know that separation isn’t just a personal sacrifice; it’s also an act of patriotism. Unfortunately, when we need each other the most, that’s when we leave each other alone. Sandberg advises kicking the elephants out of the room. People avoid bringing up terminal illness, miscarriage, deployment, the loss of a spouse, for fear of reminding the person. Sandberg told the crowd you can’t remind a person they have cancer (it’s not like they can forget). As military spouses, we’re not required to suffer in silence. Rather, the community is called to support its members. Sandberg calls the fact that she is more grateful after the death of her husband “the great irony of [her] life.” It’s easy to get into the habit of complaining, especially when your partner has staff duty for the third time this week, but a practice of gratitude is a habit worth forming. Of course, I’d rather that my child have her daddy present on her second birthday, but he’s providing a pretty great life for us. If deployment is the price I have to pay, I do it with a happy (most of the time) heart. It’s OK to cry into your pillow at night (you know, the one you dressed in your spouse’s PT shirt?). That can be an important part of processing your emotions. What you can do, however, is remove what Sandberg calls “the second derivative of pain.” We’re sad and then we’re sad that we’re sad, or we’re angry and then angry that we’re angry. When you can take off that second layer, you’re free to accept and process the initial feeling. At the end of the event, Sandberg took questions. One woman asked how we as military spouses might work to effect change in the military. Sandberg’s response? We’re doing plenty. It’s society, America and the world that should be supporting us more. Until that day, we continue to do what we’ve always done: pull ourselves up by our bootstraps and keep on keeping on. It’s the military spouse way. Want to hear more from Sheryl Sandberg’s speech at Fort Hood? Watch our Facebook Live video. 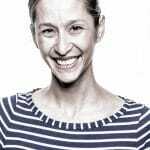 Kimmie Fink is a stay-at-home mom, staff writer at Romper, and consultant, Nationally Certified Facilitator, and blogger for Welcoming Schools, a project of the Human Rights Campaign. Her work has been featured on Scary Mommy and Sammiches and Psych Meds. Kimmie blogs on issues of diversity and equity for elementary educators and parents of young children. Follow her on Facebook, Twitter, Pinterest, and LinkedIn.